Sod, the mystical or hidden meaning. In the above verse, God assigned the land to the tribes and families, and it was fundamentally His. Therefore, changing a boundary was an affront to Him. “The land is not to be sold with any finality, because the land belongs to me. You are sojourners and travelers with me.” (Leviticus 25:23, ISV). The meaning is direct and clear. Boundary stones in Babylon had curses written right on them. The poor would have been especially susceptible to land theft by the change of boundary stones since they would have lacked the means to defend themselves (see the case of the Naboth Vineyard Incident in 1 Kgs 21). Apparently it was a special temptation of the nation’s leaders (Hos 5:10; see also Proverbs 22:28; 23:10). The verse had a very practical application. This verse, as well as the other verses referring to boundary stones, have other allegorical and mystical applications as well, one that modern political leaders should have heeded in the past and would do well to pay attention to in the future. When the jihadists of ISIS tweeted pictures of a bulldozer crashing through the earthen barrier that forms part of the frontier between Syria and Iraq, they announced they were destroying the “Sykes-Picot border.” Why is Sykes-Picot so important? One reason is that it stands near the beginning of what many Arabs view as a sequence of Western betrayals spanning from the dismantling of the Ottoman Empire in World War I to the establishment of Israel in 1948 and the 2003 invasion of Iraq. The Sykes-Picot Agreement (named after the British and French diplomats who signed it) was a document with the purpose to divide the Arab provinces of the Ottoman Empire into British and French “spheres of influence.” It designated each power’s areas of future control in the event of victory. The first was the Constantinople Agreement of March 18, 1915 that was supposed to satisfy Russia’s long-standing designs on the Dardanelles by giving Russia Constantinople (Istanbul), together with a part of Thrace and Asia Minor. In return, Britain and France were to have spheres of influence in the new Muslim states in the Middle Eastern portions of the defeated Ottoman Empire. The second agreement was the Treaty of London, signed April 26, 1915. The treaty promised the Italians specific territory at Ottoman expense in return for the Italian government agreement to join the allies against Germany and its allies. The Sykes-Picot Agreement was the third pact which came more than a year later on May 16, 1916, well after the basic deal had been agreed among the Allies and duly signed. 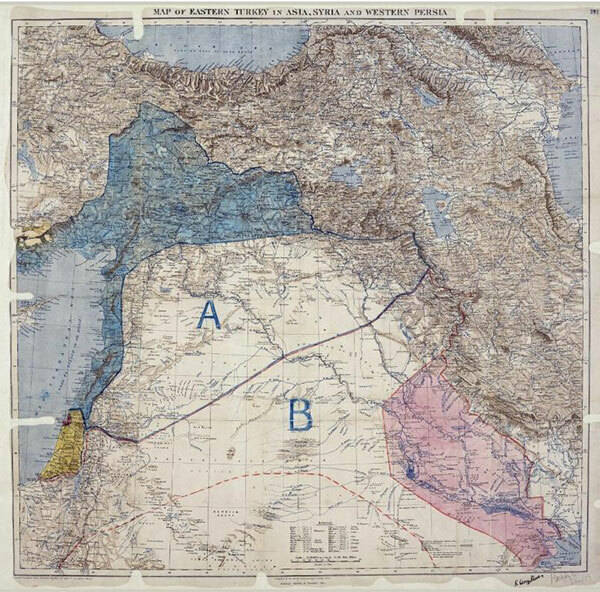 Sykes-Picot came with a map, colored in five parts: direct and indirect British and French zones, and an international zone encompassing Jerusalem and a route westward to the coast at Haifa. The fourth agreement came at St. Jean de Maurienne on April 17, 1917, which was to solidify the Italian foothold in the Middle East, but was contingent on Russian acceptance. This acceptance never came due to the Russian Revolution. As for Sykes-Picot, the agreement was to stay secret until after the end of World War I, but the Bolsheviks revealed the agreement after the Russian Revolution and sent negotiations into turmoil. Revealing the agreement also exposed British duplicity in their dealings with both the world Zionist movement and the Arabs in the region. Britain’s man in Cairo, Sir Henry McMahon, had made a promise to the ruler of Mecca, the Sharif Hussein that he would have an Arab kingdom in the event of Ottoman defeat. In fact that promise itself, which had been conveyed in McMahon’s correspondence with the Sharif between July 1915 and January 1916, left ambiguous the borders of the future Arab state, and was later used to deny Arab control of Palestine. This agreement with the Arabs was in direct conflict with the Zionists who were promised Palestine as a homeland for Jews under the terms of the November 1917 Balfour Declaration which was defined as lying “west” of the vilayet or province, of Damascus. At the end of World War I, all the diplomatic machinations from within the British government and without came to a head with T. E. Lawrence’s (of Lawrence of Arabia fame) promise to King Faisal of an Arab kingdom with Damascus as its capital coming to naught. The British and the French drew a line through the Levant to keep their colonial interests without regard to ancient Biblical, religious, or tribal boundaries. One hundred years after Sykes-Picot, the lines drawn from that agreement are in tatters. One lesson people can draw from the result of this agreement is outside powers should not try to draw other country’s borders including those of the Middle East. The reality of geopolitics, however, is once the Allies decided to dispossess the Ottomans of their imperial possessions and divide them up, upon victory in the war someone had to draw some borders somewhere. ISIS’ move to remove the dividing line between Iraq and Syria and claim the destruction of Sykes-Picot not only did help shred Sykes-Picot, but also had an immediate albeit indirect implication for Israel. That country has an interest in keeping Syria intact and preventing regime collapse in general. The interest is a complex one. Israel has no particular interest in Iraqi affairs as long as Iraq does not return to the position of being the lynch pin of a hostile “eastern front.” With regard to Syria, Israeli decision makers and analysts are divided into two schools: those who believe that it is better for Israel to have Assad stay in power, and those who believe that it is better for Israel to have him go, rather than face the consequences of a triumph by the Russia-Iran-Hezbollah axis. So far, this has been mostly an academic debate. The Israeli government knows it is in its interest to stay on the sidelines and its ability to affect the war’s outcome is limited. Israel’s current borders are an abomination of what they should be. They are not what was promised by neither God nor international agreement. The land they do have they hold begrudgingly and have to fight for every day over the objections of their neighbors and the world community. 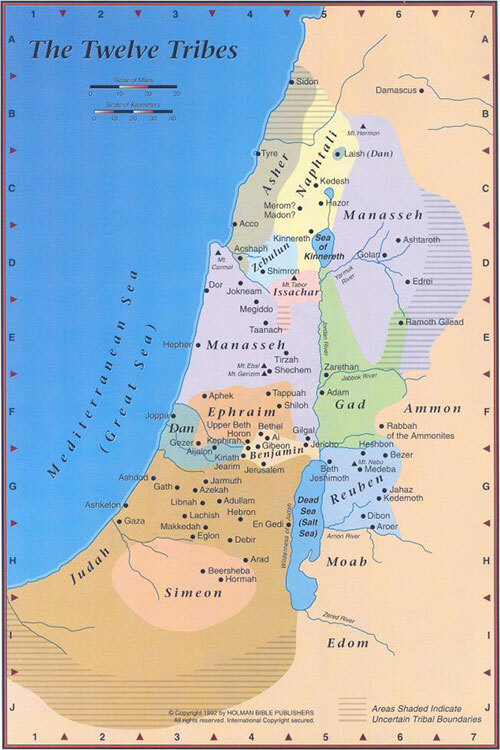 What are the true borders of the land God gave to the descendants of Abraham? To your south is the Wilderness of Zin, bordering Edom. Your southern border is to extend east toward the far end of the Dead Sea, then it is to turn southward to the ascent of Akrabbim, cross Zin, and then run south of Kadesh-barnea and proceed from there to Hazar-addar and across to Azmon. Then the border is to turn from Azmon toward the wadi of Egypt and from there to the Mediterranean Sea. The western border is to be the Mediterranean Sea. This is to be the western border. Your northern border is to extend from the Mediterranean Sea to Mount Hor. From Mount Hor, you are to mark out the entrance to Hammath, with the border running through Zedad, then through Ziphron and then to Hazar-enan. This is to be the northern border. You are to mark the border on the east from Hazar-enan to Shepham. The border is then to extend from Shepham to Riblah, on the east side of Ain, then to the Sea of Chinnereth on the east. The border is to continue along the Jordan River all the way to the Dead Sea. This is to be your land, as measured by its boundaries. Ezekiel 47 and 48 state the land in millennial Israel will be divided equally between the tribes, each tribe having one portion. In Ezekiel 47:13–21 we find even more boundary detail. Obviously, Israel only occupies a part of what was promised (and is promised) to them. Any attempt by man to apportion land to them, try as they may, will end in failure. However, the way things are progressing in the Middle East, it will not be long until the ancient markers are made right and placed where they were intended to be. Is this the end of Sykes-Picot? 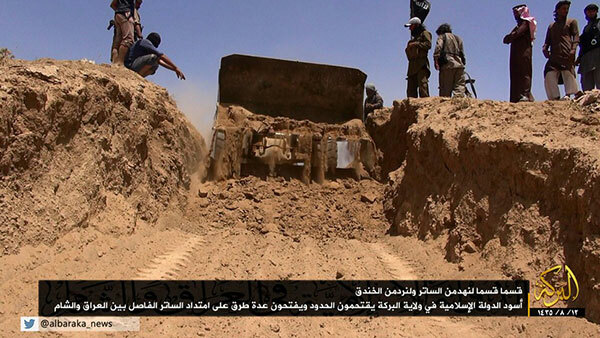 Iraq ISIS Crisis: Is This the End of Sykes-Picot?